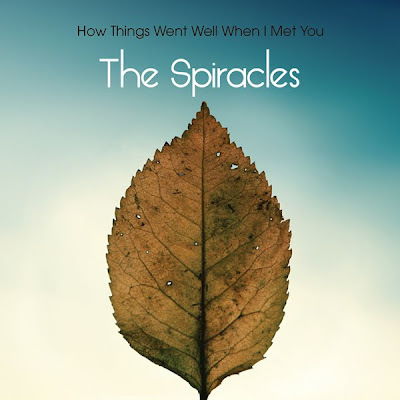 The Spiracles Prep for January Release via Saint Marie Records. Release date: January 24, 2012. For over a decade, Luis Rodriquez has been writing songs and playing guitar for the shoegaze band Resplandor. During this time he has played with Robin Guthrie, The Radio Dept, Airiel, The Ocean Blue, Mark Gardener (Ride), Mahogany, Elika, House Of Love, Altocamet, The Jesus And Mary Chain, Asobi Seksu and many more. Luis brings all of this experience to the forefront, along with the majestic and enigmatic vocals of Aracelli Fernandez, in The Spiracles. This first EP includes the beautiful indie-pop single “Fireflies”, followed by a mid-tempo “Mercy” and a lovely version of The Field Mice’s “End Of The Affair”. It also includes a remix by the shoegaze/electronica Brooklyn based band Elika and another by Canu, lead singer/DJ from the Argentina band Altocamet. Interview: Jonathan Allen and Nikki Roszko of 2060 Chiron. When The Sun Hits Interviews Jonathan Allen and Nikki Roszko of 2060 Chiron. 2060 Chiron is Jonathan Allen (founding member of WTSH faves Music for Headphones) and his fiancee, Nikki Roszko (former Black Strip Withdrawal member), and they are based in Philadelphia, PA. Their sound is best described as some sort of brilliant space-folk-electropop hybrid, with tendencies towards swirly noise, grooves and hooks; these guys exist within several genres at once, but they are transcending them all with the amazing sounds they create. 2060 Chiron was born out of many late nights listening to records and drinking wine, and we can't think of a better way for a project to be begin. We adore these guys and are anxiously awaiting the debut LP (read below for more info on that). We hope you enjoy getting to know Nikki and Jonathan of 2060 Chiron! How and when was 2060 Chiron formed? Is there a story behind the band name? Nikki: The name "Chiron" popped into my head when we were brainstorming band names. I'm not exactly sure...it was snatched from the universe. Chiron is a planet/asteroid that exhibits the behavior of a comet and orbits between Uranus and Saturn. It's from a class of objects known as centaurs. As I further researched Chiron, it just fit perfectly for the type of weird, genre-defying music we create. Also, I am a big Greek mythology geek and astronomy nerd from way back. Can you tell us what you've been working on and what you've got forthcoming in the near future (new releases, tour, etc)? We know there's an album ready to release...what's the status of that? Jonathan: Well, the album is almost done, but was temporarily put on hold when Music for Headphones picked up suddenly in October. We should have it completed very soon, I've decided to go back and add some gazey-noisy guitars to all the songs. We are playing at the XD Fest on November 19th in Chicago, so working up the live arrangements of the new songs has brought me to a place where I want to add the guitars back in to the mix. I left them out originally because I was trying to separate my playing in Chiron from that in Music For Headphones, however I think that was detrimental to the songs, so they're going back in. We've already put "Sonar" and "Liftoff" out there, but expect to hear expanded versions on the completed record. Jonathan, you're involved with both Music for Headphones and New Speedway. How do you balance your time between all those projects? The three also sound very different from one another, which we think is awesome. And Nikki, have you done any other musical projects in the past, or is this your first? Jonathan: Well, I am no longer involved with New Speedway in any way, so that changes the game quite a bit. Before Chiron was the project I worked on my in my super free, hanging out at home time, but that is changing. It's definitely turning into a project I want to focus more on and see where we can take it. Being that its just Nikki and me, we can go pretty much anywhere without much hassle. Chiron very easily exists on the backside of MFH and MFH has talked about taking Nikki out on tour with us and having two built in acts. Nikki: I have been performing since I was 16. My high school band was Gidget and Potted Plants, a folk-punk duo with surreal lyrics, kinda adorable and heavily influenced by Kill Rockstars bands. It was not long-lived. I played the same type of music solo for many years, often with fabulous sit-in musicians. Nothing really jived as a band though. 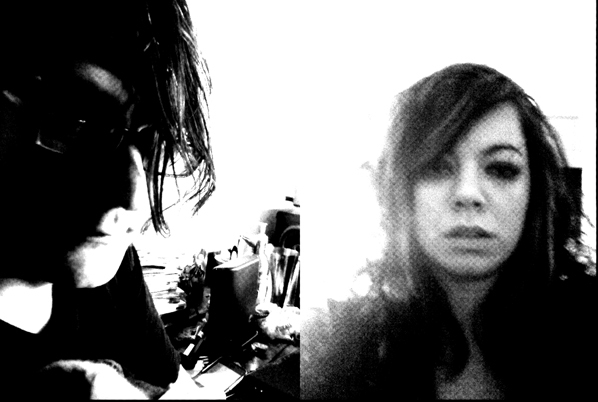 More recently I was in a post-punk/darkwave band called Black Strip Withdrawal in which I played guitar. Now Chiron, which is by far my favorite project and in which I am exploring music in previously uncharted ways. 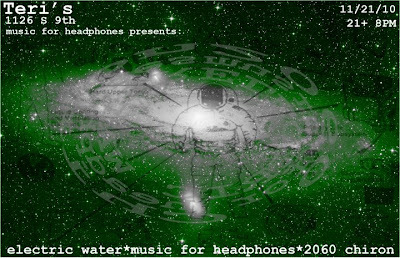 2060 Chiron probably isn't what anyone would call traditional shoegaze, but that dreamy undercurrent is nevertheless there. Defining one's sound by genre can be tiresome, but do you feel that the band identifies closely with any genre? How do you feel about genres in music, in a general sense? Jonathan: As anyone who's followed MFH would know, I have a really hard time with genre. I can't stay and exist in one place for very long. I can tell you we set out to make a "space folk" record, and it got all dance-y some how. There are some songs on the album that I think you could classify as more traditional shoegaze, we just haven't let anyone hear that part of the record yet. Its a lyrical and musical concept record, so it has a certain flow to it. Nikki: Traditional genres bore me. I like all types of music and have bounced around quite a bit. I have always enjoyed pushing boundaries and have no preconceived notions as to what Chiron can be. Jonathan: I'll let Nikki answer this one, I don't want to repeat myself to much from the MFH interview we did with WTSH, but I will add that our recent dates with the Foreign Resort blew me away. They are the most dynamic, professional musicians I have seen in ages and the nicest, sweetest guys. Last Remaining Pinnacle were also truly brilliant! Can't wait to play with either of those bands again. Nikki: There are so many artists in those genres that I am in love with. Morpheme is probably my favorite current shoegaze band. I also absolutely adore Foreign Resort, Tamryn, Spell 336, Drowner and absolutely cannot wait to hear the Bloody Knives live. As for psychedelia, I can't get enough Sleepy Sun or the Warlocks. Jonathan: I have mostly used Rickenbacker guitars for the last 14 years, but occasionally play my Jazzmaster or Casino if I need a change. I've been very seriously considering buying another DiPinto Galaxie and switching back to offset body guitars for the next little while. I miss owning one. The Galaxie and the Jazzmaster were my main guitars 1996, 2006 and 2007. I'm still using my Orange Rocker 30, its super awesome, but I am going to add a second amp back into the mix to fill out the sound. All the boxes on the ground change from time to time, and always will. Nikki: I have yet to become a gear-head. I have an Alesis Micron that I have been exploring as well as sparkly new guitar sounds. I have a Danelectro and play a Rickenbacker 625. What recording gear do you use? Jonathan: Well, that's part of how this Chiron record was recorded. All the MFH stuff is recorded at my studio with "professional" gear. I was curious what I could do with a home set up, I purchased a Focusrite Saffire 6 USB, Pro Tools 9, and a B.L.U.E. Spark and went to work with out all my more expensive pre-amps, microphones, and mixing equipment. However, now that I want to add in all the guitars, I'll be transferring the whole thing into Nuendo at the studio, so I'll probably end up mixing it there, which will give it a different sound. Jonathan: I'm going to let Nikki answer this one, we are coming into this project from different places. Nikki: The music industry, like so many other great giants has exploded and in no way resembles what it once was. This is an exciting time to be an artist because it frees us from expectations, binding contracts and the need to fit one's music into a specific genre for the purpose of marketing. At the same time it has created a massive chasm in which it is easy to get quite lost. It is imperative that artists and labels band together to help each other get heard and develop fan bases. It has become much more populist and requires a great deal of work from the artists with little monetary reward. This means that only those in it for the love of it will survive. When it comes to label releases versus DIY/bandcamp and the like, what is your stance, if any? Do you know if you'll be releasing the 2060 Chiron LP via a label (and if so, who?) or will it be a self release? Jonathan: Well, MFH exists in both worlds. I release so much material via my own Evol Recordings and primarily use Bandcamp and limited edition physical product, but we are also clearly involved with XD Records who are putting out the new MFH full length next year and it looks like "reissuing" Life.in.Mono on cassette in the very near future. We honestly haven't given any thought as to who will pay for the Chiron record, but have a an idea of what we want the release to be. We will give some more thought to it in coming months. Jonathan: I prefer vinyl by quite a lot. There's nothing better than sitting on the couch listening to records and having good conversation. I love DJing as well. However, mp3s get listened to everyday as well. I haven't listened to a cassette in years, but am totally excited about the prospect of releasing music in that format because it takes me back to my DIY high school riot grrl days where we made tape after tape to see in school and at shows. There was something raw about that process and the format that felt so good. Nikki: For the purpose of hearing the nuances of music, give me vinyl any day. MP3s certainly have their place. There is so much music out there that I would never have heard without the massive pool of MP3s available. It's like a giant mixtape. Of course, I love actual mixtapes as well, for the same reason. I never had much money growing up so I relied heavily on music sharing. Nikki: God, where do I start? Mazzy Star has been a huge influence on my music like forever. I also am into the Cranes and Tamryn. From the standpoint of vocals, I like the sound of the little girl lost immersed in a sea of sound--noise, fuzz, big electronics. I am also heavily influenced by literature--- Burroughs, Kathy Acker, Debra Levy, Henry Miller. If you had to choose one 2060 Chiron track that was the ultimate definition of your sound, which would it be and why? Jonathan: I think its too early in the process to answer this honestly. I think the whole cycle of songs are necessary to truly get to the essence of what 2060 Chiron is about, but I will say its more like "Liftoff" than "Sonar." Though there is more of the sensuality that permeates "Sonar" throughout the record, there is more a overwhelming feeling of desolation and loss that prevails, Nikki? Nikki: I would agree. We are still a young band. Liftoff is probably a good illustration of where we are going. I think the juxtaposition of sensuality and desolation between both Sonar and Liftoff best defines our sound. Jonathan: It actually works pretty much the way MFH writes. The musical tracks are all almost completed before Nikki even starts writing the lyrics. Nikki: I like having a concept when I am writing lyrics, even if I never ever ever tell anyone what it is. I listen to the tracks that Jonathan records over and over again until phrases come together then the songs write themselves. Jonathan: Get to Chicago and blow people's minds! Jonathan: Everybody knows this is nowhere. Nikki: Somewhere between Taoism and Buddhism. I go where the river takes me without trying to direct it too much. Sometimes this gets me into tight spots but I always manage to find my way. Tonight: The Doomgaze Edition of When The Sun Hits on Strangeways Radio. Hosted by DJ Amber Crain. Tonight on Strangeways Radio! The Doomdaze Edition of When The Sun Hits. Stream it live, 10pm-11pm EST, HERE. Heads up, local folks, that's 9pm-10pm CST! Come join me tonight for When The Sun Hits on Strangeways Radio. In celebration of Halloween, this week's show is dedicated to DOOMGAZE. Yes, I've trolled the murky waters of fringe shoegaze for you in order to drag up the darkest, loudest mire possible. Black out the windows, grab your headphones, and go down the rabbit hole tonight on Strangeways Radio. Disclaimer: I am not responsible for any subsequent nightmares you may have. Enjoy All Hallow's Eve. Expect to hear dark cuts from Nadja, [aftersun], Jesu, and a LOT more. 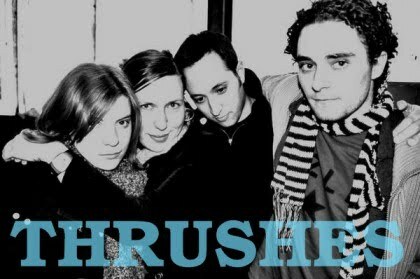 Interview: Anna Conner and Casey Harvey of Thrushes. The Baltimore-based noise pop quartet Thrushes have been charming gazers since 2007 with the release of their debut album, Sun Come Undone. Members Anna Conner, Casey Harvey, Rachel Harvey and Scott Tiemann, having cut their teeth in the formative Baltimore all-ages indie scene of the mid-90's, came together to form Thrushes, and they've been creating their unique brand of catchy gaze grunge ever since. You can check out their website HERE. Enjoy the interview!